Two Dutch journalists have been abducted in Colombia in an area near the Venezuelan border. Derk Bolt and Eugenio Follender went missing at the weekend in Catatumbo, a region where several armed groups operate, including the left-wing ELN. They were searching for the mother of a Colombian child adopted in the Netherlands a few years ago. Last year the ELN rebel group kidnapped a Spanish journalist and several Colombians in the same area. All were later released. 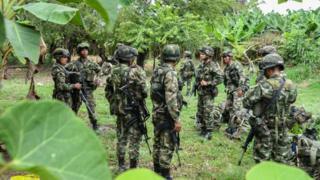 The Colombian army says it has sent specialist forces to the region to search for the Dutchmen. They work for the Dutch TV programme Spoorloos, which traces lost relatives. Derk Bolt is a presenter and Eugenio Follender a cameraman. The two men were working in the municipality of El Tarra on the border with Venezuela – an area where rebel group the ELN (the National Liberation Army) is strong. There are strong suspicions that the group was responsible. Last year in the same area Spanish-Colombian journalist Salud Hernández Mora was kidnapped by the ELN, as were two Colombian journalists, Diego D’Pablos and Carlos Melo, who had gone to the area to cover the story. The ELN is the second largest left-wing guerrilla group in Colombia, behind the Farc. The Farc signed a peace deal with the government last November and are already disarming and preparing to enter civilian life. The ELN only started peace talks in February this year. The group has insisted on a bilateral ceasefire but the government says this would be conditional on the ELN ending kidnapping – something that has not yet happened. During the negotiations there have been military operations against that insurgent group as well as attacks against security forces by the ELN.